A rotator cuff tear is a tear of one or more of the tendons of the four rotator cuff muscles. A rotator cuff injury can include any type of irritation or damage to the rotator cuff muscles or tendons. Rotator cuff tears are among the most common conditions affecting the shoulder. The tendons of the rotator cuff, not the muscles, are most commonly involved and of the four, the supraspinatus most frequently, as it passes below the acromion. Such a tear usually occurs at its point of insertion onto the humeral head at the greater tubercle. The cuff is responsible for stabilizing the glenohumeral joint and rotating the humerus outward (external rotation). When shoulder trauma occurs, these functions can be compromised. 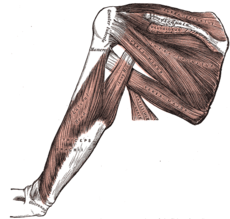 Since individuals are highly dependent on the shoulder for many activities, overuse of the muscles can lead to tears, with the vast majority again occurring in the supraspinatustendon. Many rotator cuff tears are asymptomatic. They are known to increase in frequency with age and the commonest cause is age-related degeneration and, less frequently, sports injuries or trauma. Both partial and full thickness tears have also been found on post mortem and MRI studies in those without any history of shoulder pain or symptoms. There are two main causes, injury (acute) and degeneration (chronic and cumulative), and the mechanisms involved can be either extrinsic or intrinsic. Acute tears occur as a result of a sudden, high stress motion or impact, such as a fall on the outstretched arm, or a heavy lift with a jerking motion.  They can also occur in association with other shoulder injuries, such as a broken collarbone or dislocated shoulder. Chronic tears are indicative of extended use in conjunction with other factors such as poor biomechanics or muscular imbalance. Ultimately, most are the result of wear that occurs slowly over time as a natural part of aging. They are more common in the dominant arm but a tear in one shoulder signals an increased risk of a tear in the opposing shoulder. Several factors contribute to degenerative, or chronic, rotator cuff tears of which repetitive stress is the most significant factor. This stress consists of repeating the same shoulder motions frequently, such as overhead throwing, rowing, and weightlifting. Many jobs that require frequent shoulder movement such as lifting and overhead movements also contribute. Another factor in older populations is impairment of blood supply. With age, circulation to the rotator cuff tendons decreases, impairing the natural ability to repair, ultimately leading to, or contributing to, tears. The final common factor is impingement syndrome, the most common non-sport related rotator cuff injury. This occurs when the tendons of the rotator cuff muscles become irritated and inflamed while passing through the subacromial space, the passage beneath the acromion. This is a relatively small space and becomes even smaller when the arm is raised into a forward or upward position. Repetitive impingement can make the tendons and the bursa inflamed, resulting in the syndrome.